One of the Balearic Islands in the Mediterranean, the Spanish Ibiza is a holiday destination voted to beach tourism, entertainment and life at sea. There are three major cities, Ibiza, Santa Eulària des Rius and San Antonio. The first, with the same name of the island, is even the capital, with its 48 thousand inhabitants. Ibiza has a curious history, made up of agriculture and peaceful fishing for several centuries. Inhabited and frequented since ancient times by Carthaginians, Romans and Catalans, the island had remained in the background, quiet and not at all dedicated to tourism until it was literally rediscovered as a tourist resort in the mid-50s and becoming the aspired place for European tourists, especially for the beaches. Ibiza is now an island dotted with first class hotels, behind the large fine sandy beaches such as Playa d'en Bossa, Cala Llonga and Playa Talamanca. The coast, rough and irregular, reflects the different souls of Ibiza: the night life and beaches (with fashion shows and discos animated by the best DJs in the world); a little further, the small town is still inhabited by the fishermen of Portinatx, with rocks on the sea; beyond this, the Romans’ remains. Even those in search of silence can find the right place in Ibiza, for example, falling into one of the coves (Cala d'Hort, or Platges de Comte). The crystal blue of the waters surrounding this magical island is due to the presence of the aquatic plant Posidonia Oceanica, recognized by UNESCO as a World Heritage Site. Who is on the island cannot miss the many traditional markets, selling the historical crafts of Ibiza, from jewelry to embroidery, from ceramics to fabrics. A dip in the story can finally be enjoyed by visiting the Renaissance city walls of Ibiza Town and the Punic necropolis of Puig des Molins. 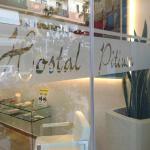 On the lively island of Ibiza, a short walk from the wide beach of Figueretas, you will find Hostal Pitiusa. Situated close to clubs and restaurants, it offers easy access to bus stops and discotheques in the city. 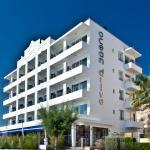 In a beautiful location in Ibiza, near popular nightclubs like El Pacha and El Divino, the Hotel Ocean Drive awaits you. 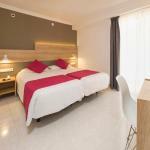 It offers easy access to the port and the beach of Talamanca, which are minutes away on foot. 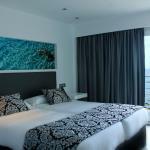 In the lively island of Ibiza, on the waterfront, you will find the Hotel Nautico Ebeso. Not far away, sail boats depart for day trips to the island of Formentera. A few steps away from Figueretas beach and only a ten minute walk from the heart of Ibiza, you will find the beautiful Hotel Apartamentos Lux Mar. 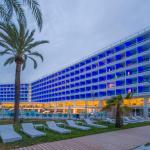 Maritimo Hotel is located near the beach of Figueretas in the beautiful resort of Ibiza. The property is located near the seafront, just 1 km away from the port where you can take ferries to Formentera.